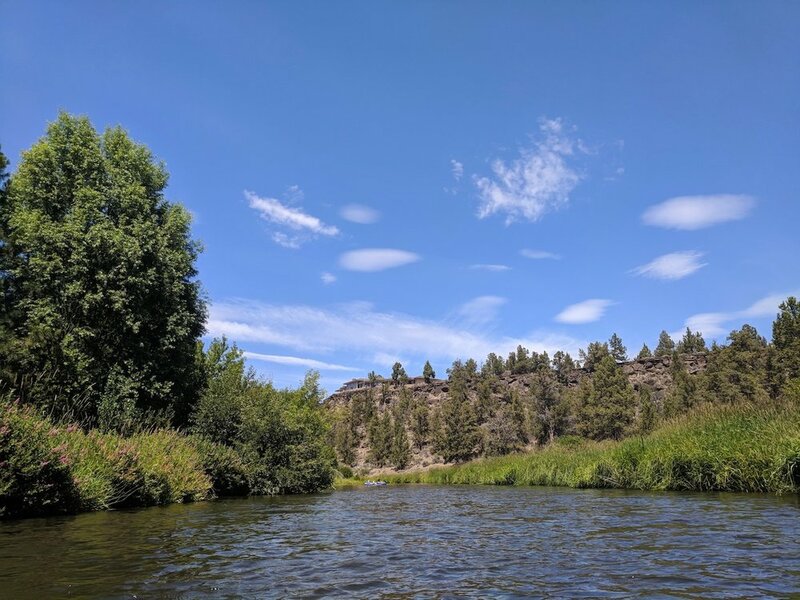 This weekend we were on a mission to float the river near Tumalo, Central Oregon. 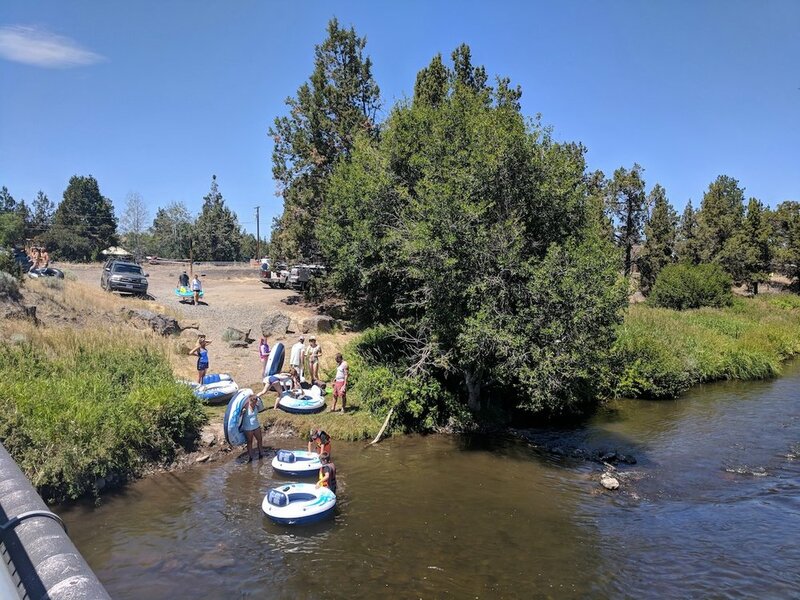 We really enjoyed riding inner tubes in Bend. Floating is so popular there, you can easily rent tubes, take the $3 shuttle, and ride for two hours or more. 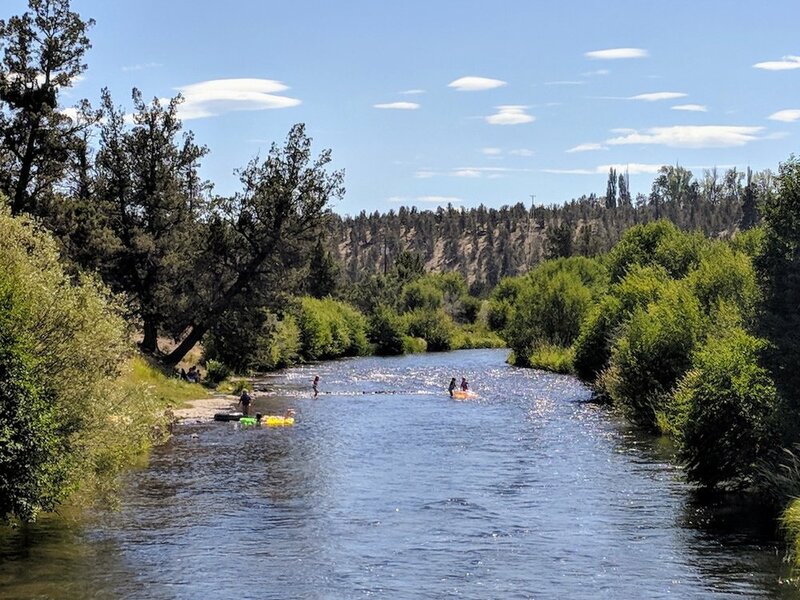 If you’re visiting and don’t have your own tubes, Bend’s a good place to start. But we were hoping to find a spot with less crowds that was a bit closer to Redmond. We had heard rumors about floating in Tumalo but found very few details online (hence why we’re sharing our experience in this blog post). 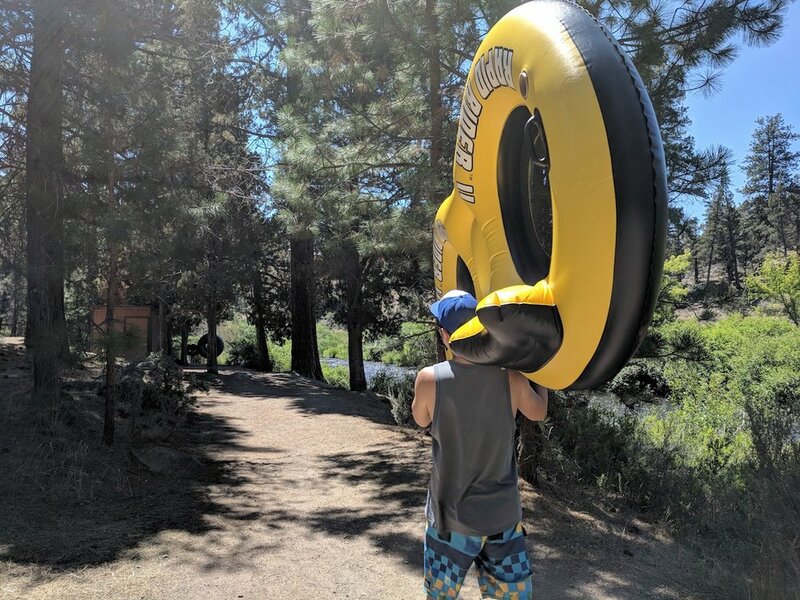 We scoped out the situation, left a car in Tumalo, and got dropped off at Tumalo State Park with our double inner-tube and double ziplock bags for car keys, phone, and sunscreen. 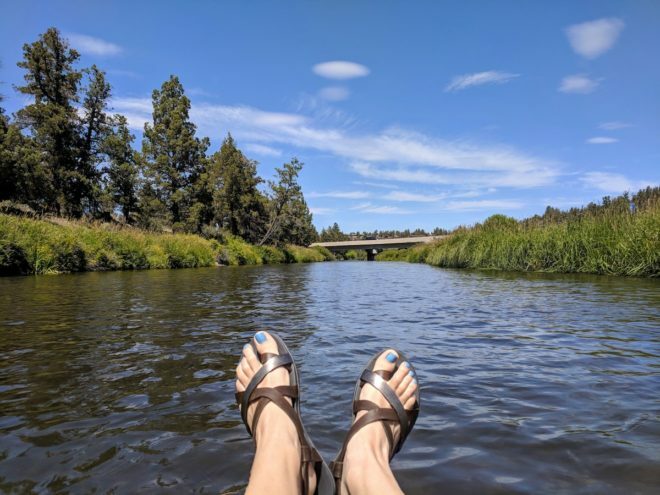 Update: We returned a month later to try floating the remaining part of the river from Tumalo to Twin Bridges. 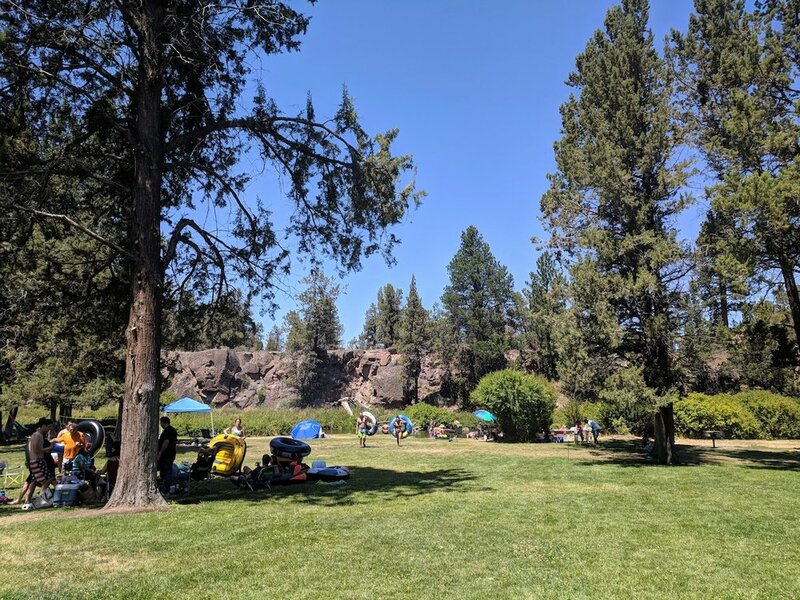 If you’re camping at Tumalo State Park or staying in the day use area for a picnic, there are several places to put in your tube or raft and start a float. The park was very busy when we went, since it was a hot summer weekend. A State Parks pass or day use fee is required, although there was also a little bit of parking on the main road just outside the park entrance. We were just getting dropped off to start our journey, so we temporarily pulled into the campground side to unload. 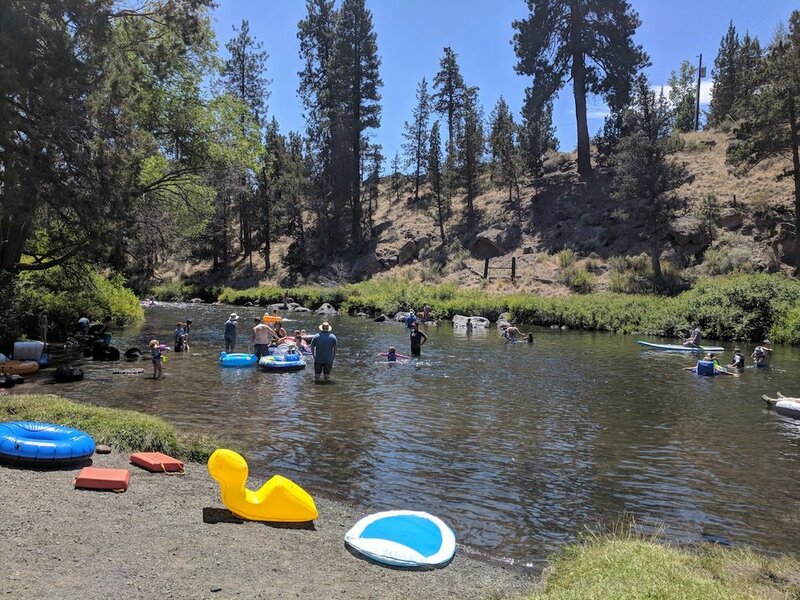 The thing to do seems to be: pump up your tube or raft in the park, then follow the riverside trail through the picnic area and pick a spot to begin. According to Google Maps, you could potentially walk almost a mile up river on the trail. 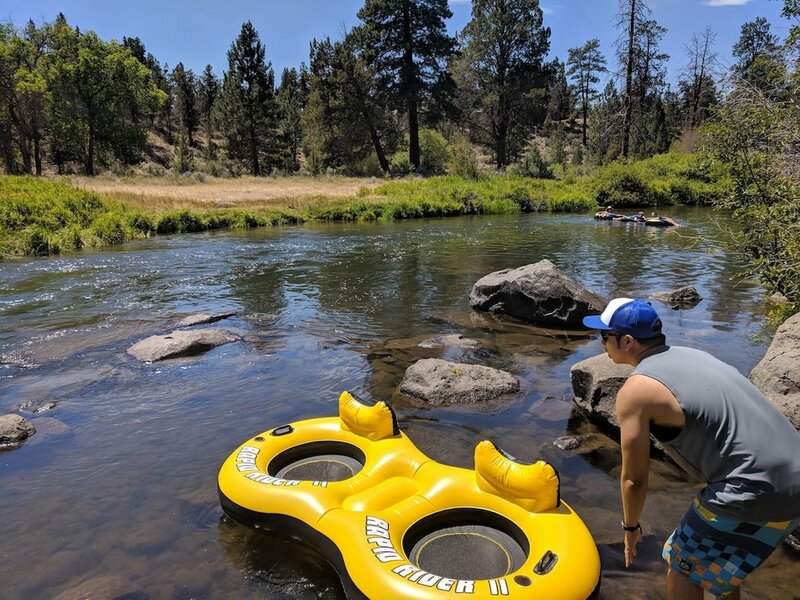 As we followed it, we were noticing a number of spots along the river that looked pretty shallow, so we decided to put in our double tube near the first bend. 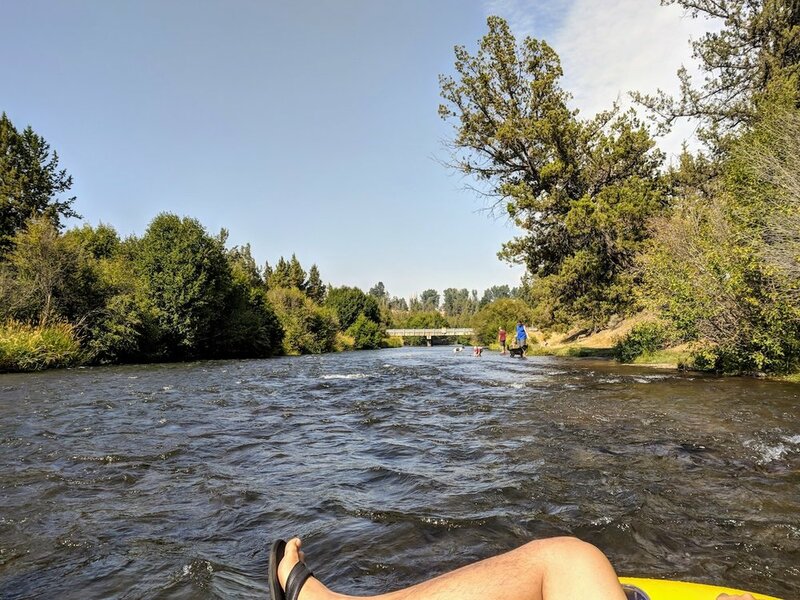 To be honest, this section of river in the State Park did get pretty shallow in a number of spots, and we were starting to question our decision to tube in Tumalo. It didn’t help that our cheap tube from Fred Meyer wasn’t holding its air at maximum capacity. So we bumped a couple of rocks with our bums, but nothing too bad – no bruises! I’m sure if you had a sturdier inner tube to float the river, it wouldn’t be as bad. 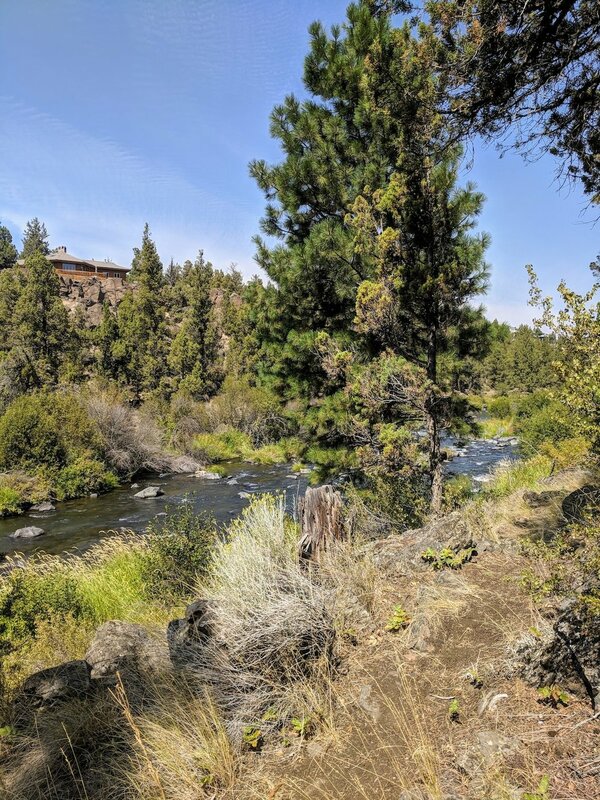 If you start near the entrance of Tumalo State Park, it takes about 30 minutes to reach the outskirts of Tumalo and another 30 minutes or so through town to reach the parking lot at Tumalo Road. 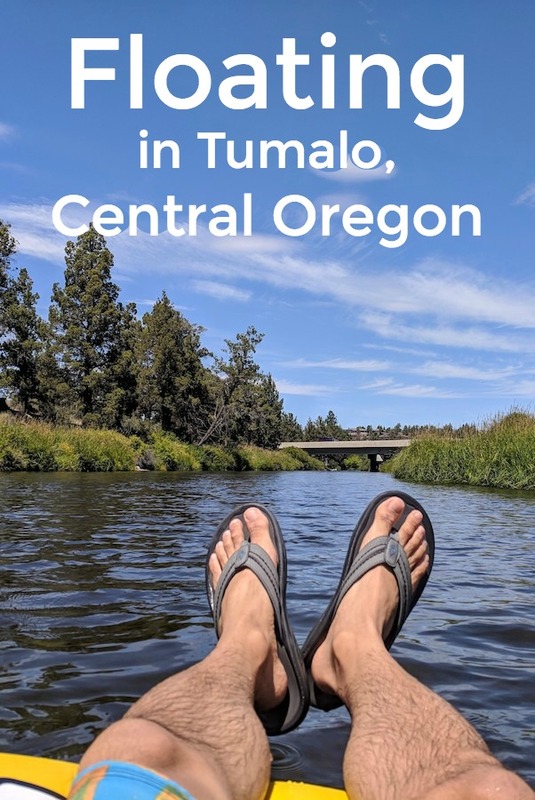 Going through Tumalo was one of my favorite parts. You could see houses along the riverfront and even chat with people hanging out on their lawns as you go by. We got out immediately after passing under the Tumalo Road overpass. The small parking lot was full that Saturday afternoon, so we had left a car on the roadside right across from it. There were also people parking along the roads near Tumalo Coffee House, which is just a block away. If you’ve worked up an appetite, it’s just a short walk down Cook Ave to the food carts in Tumalo. We’ll definitely have to do that next time. Our total time on the river was about 90 minutes. That includes some time floating the State Park, since we hiked up the riverside trail a bit before putting in. 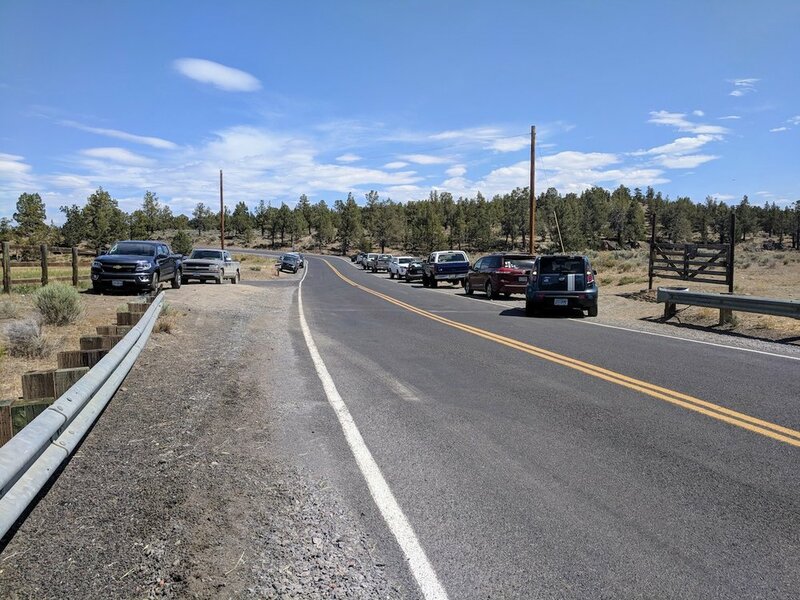 As we got out at Tumalo Road on that first run, we saw quite a few people starting their float at the same spot. We asked them how far they were going, and they said they had left their cars at Twin Bridges. They estimated it would take around 2 hours. And they said that section of river is also a mix of slow, glassy spots as well as some shallow sections and minor rapids. 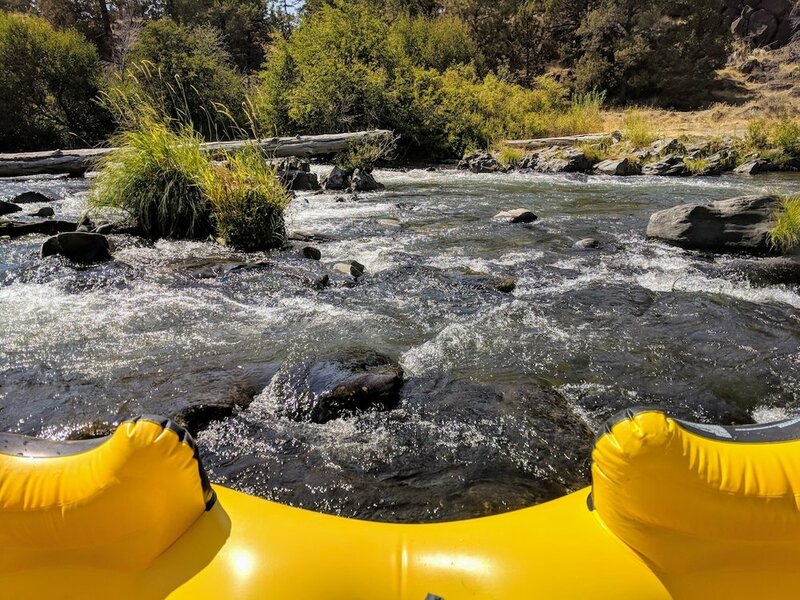 To do our float from Tumalo to Twin Bridges, we decided to bring our two-person tube again. In hindsight, this probably wasn’t the best idea. But we did have fun! The tempo varies a lot on this ride. My favorite part (again) was drifting past peoples’ backyards as we left Tumalo. Then, there are two significant sections with rapids, shallow rocks, and downed trees to navigate around. Having the larger tube made it easier for us to get stuck. Sturdier, single inner tubes are able to power through those spots without fear of popping. Not so with our cheap tube! At the first hairy section, which happens at a kind of fork in the river, we ended up having to get off the tube and walk. Either side of the fork was shallow and bumpy, and we were afraid of popping our tube. Walking in the river was a bit treacherous. The river rocks are pretty slippery. We found our way to land and were able to walk along a path until the river got less rocky. In fact, it appeared that there were trails on both sides of the river most of the way. Around the two hour mark, there’s an old wooden bridge crossing the river. We almost mistook it for our end point until we realized it was only for pedestrians. From that point, there’s still 20 to 30 minutes of floating. It took us 2 hours and 20 minutes to reach Twin Bridges Road. Being a Wednesday afternoon in August, we saw only two other groups of people floating. We passed more people hanging out on the banks of the river, fishing or wading with kids, than inner tubing. There are some open areas to the right where you can pull off and walk back to your car. A sign on the bridge indicates the importance of exiting at that point – or you’ll face a dangerous waterfall after the bridge. If you’ve floated this area of the river, please let us know your tips. We always aim to keep our information up-to-date and accurate so that everyone can enjoy a safe experience while roaming around Redmond!